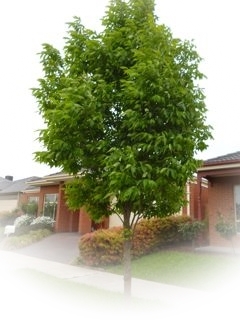 With dark red orange Autumn colour and lustrous dark green Summer foliage this a great shade tree for any garden or park. Tolerates both heat and frost. Very uniform branch structure and attractive dark bark makes it is an elegant sight even when branches are bare in Winter. Prefers moist, well drained soil.